However, not everything medical can withstand the high temperatures necessary to bring about absolute sterility. Items such a soft rubber goods and surgical implants, for example. would all be damaged by high temperatures. An alternative is gaseous sterilisation. Ethylene Oxide (EO) gas kills all known bacteria and their endospores and is highly effective in sterilising materials that would be damaged by other methods. Unfortunately, EO is carcinogenic, toxic, highly flammable, potentially explosive and gasifies at 10ºC. This necessitates full hazardous area compliance of all electrical and mechanical equipment utilised in the sterilisation process. Getinge UK of Sutton-in-Ashfield is a centre of excellence in the design and construction of EO sterilisation systems and installs bespoke sterilisation plants worldwide. In a typical system, pallets of the products to be sterilised are first subjected to a temperature of around 55ºC at around 70% RH in a conditioning area which ‘activates’ any microbes and renders them more susceptible to the EO gas. The pallets are then loaded into the hermetically sealed sterilisation chamber which is then flooded with EO gas at below atmospheric pressure. During the typically 12 hour exposure period, it is critical that the EO gas is maintained as a homogenous environment throughout the chamber. 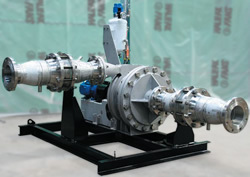 To achieve this a specially designed explosion-proof Halifax Fan blower is used to continuously circulate the gas through manifolds on the sides and top of the chamber, changing the entire volume of the chamber typically 8 to 10 times per hour. The potentially explosive nature of Ethylene Oxide means that the circulating blower has to be designed to meet the exact needs of every installation and to full explosion-proof standards. Halifax Fan’s design is based upon many years experience building fans and blowers to handle explosive gases and features spark-proof features such as brass rubbing strips and a coupling guard. The stainless steel 316 shaft is fitted with a dual cartridge mechanical shaft seal purged and cooled with water. The fan is rated to work down to very low sub-atmospheric pressures but the high integrity, gas tight, stainless-steel casing is designed to +10Bar and tested to +11Bar. ATEX certified stainless-steel inlet and outlet flame arrestors protect against potential flame propagation beyond the fan in the event of internal combustion. ATEX certified accelerometers and vibration monitors are included for early detection of any imbalance in the fan impeller that might lead to contact with the casing, potentially causing a spark. According to Shaun Riley, EO Product Specialist at Getinge, ‘we attach so much importance to this item that we wanted it designed, built and certified by specialists and supplied as a reliable fit-and-forget fully certified component. It was essential we deal with a manufacturer with a proven expertise in ATEX and hazardous gas applications. Halifax Fan worked closely with us to develop a range of bespoke blower sizes that we can use for quotation purposes and then, once we have a contract settled, the design is fine-tuned to the exact specification of that application. Although the blower comes to us fully certified to ATEX 94/9/EC for Category 2G, Zone 1, it is actually fully rated for duty at Category 1G, Zone 0, meeting the most demanding specifications of all our applications. Halifax Fan’s self certification for Zone 1 satisfies the environmental and gas groups with which we must comply but we also draw confidence from the increased safety margin of the more demanding Cat 1, Zone 0 rating to which Halifax builds the fans.